The Illinois State Academy of Science annually awards grants and makes presentation awards to our student members in support of developing science achievement. In addition, faculty and research members periodically receive special recognition awards. T.K. 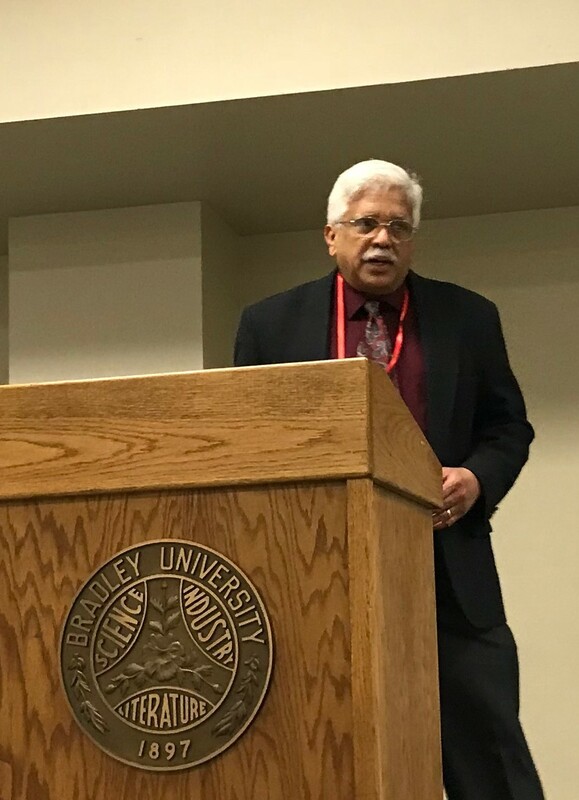 Vinod, WIU-Chemistry, receiving ISAS Fellows recognition at Annual Meeting held April 5&6, 2019, at Bradley University. Annual competition for student research grants to support research efforts. Recognition of excellence for student presentations at the annual meeting. Specific division awards, currently the Botany Travel Grant. Recognition of outstanding service to science and the Academy as an ISAS Fellow. Occasional other outstanding awards, such as Honorary Memberships and the Centennial Award. Illinois State Academy of Science, itself, received 2018 Best of Springfield Award due to its service and promotion of science. Competitive grants are awarded annually to Illinois high school, undergraduate, and graduate students who are members of the Illinois State Academy of Science. High school awards are up to $200 each, undergraduate awards are up to $500, each and graduate awards are up to $1,000 each. Online proposals will be accepted in September via the online application portal and announced in December each year. Best oral and poster presentations are awarded at each annual meeting. Abstracts and more information about each presentation is available from our Annual Meeting Supplements under the Annual Meetings tab. Does Length of Stay in Rehabilitation Influence the Magnitude of the Acute Stress Response in Birds of Prey? Proposals accepted February 1st through March 24th of each year with notification of recipients by April 1st. Online form not yet available. Contact ISAS for information. Advisor support letter required. Online form not yet available. Contact ISAS for information. College undergraduates and graduates compete for up to two $250 awards each year. Previous Botany Travel Grant Award recipients. Nomination only by current ISAS members.